Almont is a unique gallery featuring a wide range of decorative and functional art created by local fine artists and artisans. We are committed to supporting the arts, spoiling our collectors and esthetically enhancing our amazing community. Our extensive selection of whimsical gift items, handmade and designer jewelry and original greeting cards, coupled with our First Friday, Wish List and our Bridal Registry makes gift giving easy. Meet the artists, fill your day with color, be inspired and feed your soul. 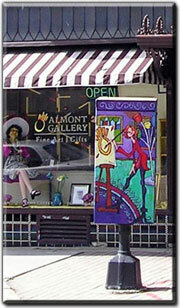 Discover Almont Gallery today! Monday through Friday 10am to 6pm, Saturday 10am to 4pm and Sunday 12 to 4pm.